From Saturday, July 5th to Sunday, July 27th 2014 the Tour de France will take place for the 101st time. If you are one of us and can’t wait to follow the Tour from the first to the 3.664th kilometer you are in the right place. 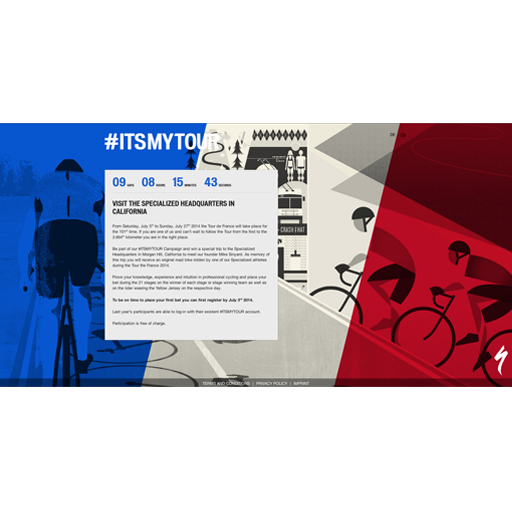 Be part of our #ITSMYTOUR Campaign and win a special trip to the Specialized Headquarters in Morgan Hill, California to meet our founder Mike Sinyard. As a keepsake of this trip you will receive an original road bike ridden by one of our Specialized athletes during the Tour the France 2014. Prove your knowledge, experience and intuition in professional cycling and place your bet during the 21 stages on the winner of each stage or stage winning team as well as on the rider wearing the Yellow Jersey on the respective day. To be on time to place your first bet you can first register by July 3rd 2014. This entry was posted in Uncategorized and tagged merchandise, promo, Tour de France 2014 on 06/25/2014 by admin.